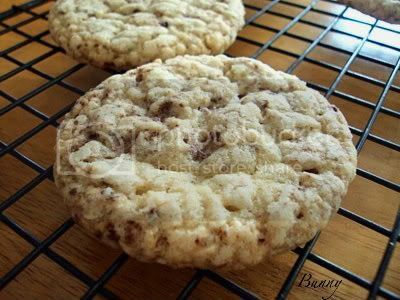 This is NOT your average oatmeal cookie! This is the most light, buttery oatmeal cookie I've ever made. Somewhere between a shortbread and a sandie cookie. The first thing you feel when you bite into this cookie is how light and airy it is, it has this slight crisp, and then the lightness hits your mouth, along with the orange and chocolate flavor, absolutely amazing! I made it for our family dinner tonight, my sister in law Mary Beth picked one up and took a bite, she turned and looked at me with her eyes wide and said....What are these, they're delicious! I did change the recipe a bit, the original recipe called for pecans, my mouth was craving orange and chocolate. I switched out the two tsps of vanilla extract for 2 tsps of orange extract, I switched out the pecans for 4 ounces grated semi sweet chocolate. I wanted to use mini chocolate chips but didn't have any....grated chocolate worked just fine. I also put the one cup of regular oatmeal that used into the food processor and pulsed till it was flour like. I used my one tablespoon measuring spoon to measure the cookie dough out. These baked for 20 minutes in my oven, then they went straight on to the cooling rack. 1. Preheat an oven to 325 degrees F (165 degrees C). Line a baking sheet with parchment paper. 2. In a bowl, mix the flour, baking soda, and salt. In a separate large bowl, mix the butter, 1 cup confectioners' sugar, and vanilla until the mixture is smooth and creamy. Stir in the flour mixture; gently stir in the oatmeal and pecans and lightly mix until combined. 3. 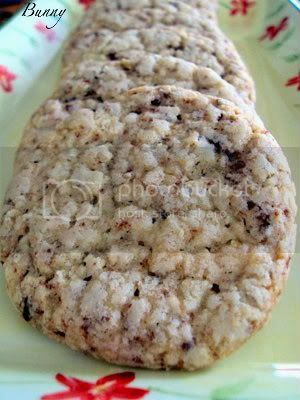 With a spoon, drop about 1 scant tablespoon of dough per cookie onto the prepared baking sheet. Bake in the preheated oven until lightly browned, about 20 minutes. Let cool completely before sprinkling cookies with confectioners' sugar. These cookies freeze well so I often make a double batch. The trick is getting some into the freezer before they're all gone! You can use walnuts instead of pecans and regular oats for quick-cooking oats. Everything is always so interesting over her. I love it! That crusty bread, the blue cheese the cookies- ah! I know I saw this every time I come by, this time I really, really, really mean it...these posts are outrageously good! I love them ALL!!! Oh my!!! Everything always looks so delish here. It's hard to decide where to dig in. I want to down that martini, especially if it's nicely chilled on a 105 degree day. That sandwich looks really tasty. I agree iwth you that a plain sandwich of a couple slices of meat between bread is nothing special, but ifyou upgrade the bread and the fillings, a sandwich can be something special. What's not to love about bacon, avocado, and provolone? It all looks great! I really love the photo of the Martini! Do you know that Pillsbury featured your blog on their Facebook page today for the sandwich? Congrats! Hey Dis, I'd make you a special martini that was ICE cold just for you. I heard you're having a Heat Wave up there in NY! Hope you can keep cool! Jolene, the drink is on the way! Sounds like a fabulous sandwich. Perfect to take to a get together. Don't know where I would start! It all looks delicious...I'd probably start with the cookies though! I got hungry just looking at your site! I'll definitely be following you, and as a result end up 20 lbs heavier! I love everything! I think I'm going to make the cookies for Jesse's work this week. They're simple and I was thinking oatmeal. Perfect! Thanks!